Beneath a vexing tangle of funding operations — most hiding under a pretense of “good works,” “humanitarian aid,” and “public interest” — there is at work a sophisticated, multi-faceted, well-oiled propaganda machine against Israel. A chief concern in the Knesset is how to curb the influx of millions of foreign dollars used to fund anti-Israel hate-groups operating as NGOs. These organizations are accused of using their “human rights” designation to mask a deceptive advocacy agenda to undermine, and even to destroy, Israel. When Israel works to build “bridges for peace,” such as SodaStream, where Arabs and Jews worked peacefully together, these organizations then knock them down. Apparently, no one at World Vision asks the obvious question: Why are there even refugee camps in territories controlled by the Palestinian Authority (PA) and Hamas, such as Gaza, Jenin and Ramallah? Not only have those areas been under exclusive PA or Hamas civilian administration since 1994, but Israel totally evacuated the Gaza Strip in 2005. 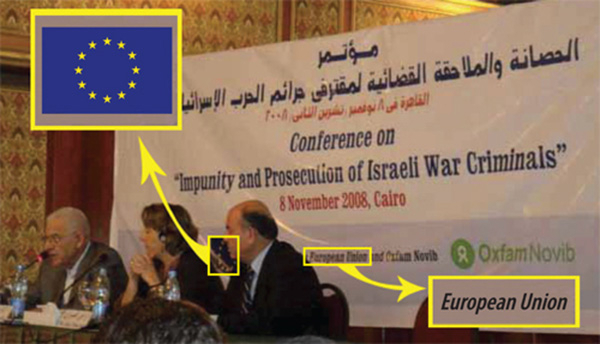 There is a European “jihad” against Israel. A significant number of activist groups — presenting themselves as international humanitarian aid and charitable projects designed to benefit the Palestinian people — are actually “directly or indirectly active in Boycott, Divestment and Sanctions(BDS) campaigns, lawfare, delegitimization and lobbying against Israel,” according to a detailed report by NGO Monitor. Every year, European governments send hundreds of millions of dollars for humanitarian aid projects in Palestinian territories. Ostensibly, the money is intended for projects such as improving medical care, alleviating poverty, improving schools, or enhancing infrastructure. But beneath the surface lurk more venomous political advocacy agendas apparently designed to undermine Israel as a nation-state. Some of these European governments give money directly to the Palestinian Authority (PA). Others funnel it through non-governmental organizations (NGOs) that are present themselves as charitable groups. These governments and European-funded NGOs, however, often seem more dedicated to propaganda, political activism and undermining Israel, and less aimed at helping the Palestinians. Between 2012 -2014, for instance, more than $27 million in foreign funds have flowed into the bank accounts of radical left-wing NGOs in Israel, all in some way involved in anti-Israel advocacy activities. Israeli leaders are finally beginning to raise serious doubts about the real motives behind some of these politically-motivated efforts. Recently, for example, a controversial exhibit by “Breaking the Silence” (BtS) opened in Zurich, Switzerland. The BtS exhibit accuses the Israel Defense Forces (IDF) of human rights violations. It incorporates anecdotal, unverifiable, anonymous testimonies of 60 soldiers who accuse the IDF of wrongdoing during Operation Protective Edge in Gaza last summer. The exhibit, scheduled for a world tour, caused a stir in Switzerland when it became known that it was funded in part by the governments of Switzerland, the UK, Ireland, the Netherlands, Sweden and Denmark — as well as many private charitable foundations. Its main donors include: the European Union, Misereor (Germany), Broederlijk Delen (Belgium), Norway,AECID (Spain), Dan Church Aid (Denmark), ICCO (Netherlands), CCFD (France), Human Rights and International Law Secretariat (joint funding from Sweden, Switzerland, Denmark and the Netherlands), Sigrid Rausing Trust (UK), SIVMO (Netherlands), Rockefeller Brothers Fund,Open Society Institute, and the New Israel Fund among others. The BtS exhibit spins a narrative that seems deliberately distorted and lopsided against the IDF. The exhibit’s critics suggest that these soldiers may have been selected precisely because they had some axe to grind against the IDF. It even turns out that funders of the exhibit demanded “a minimum number of negative testimonies,” according research by NGO Monitor. The exhibit never mentions any context surrounding the Gaza operation: nothing about the rockets raining down on Israel from the terrorist groups in Gaza; nothing about Hamas-built tunnels that opened near schools and private homes inside Israel; nothing about Hamas’s common practice of hiding terrorists and weapons among its own women and children for propaganda purposes. Israel’s government, understandably, cried foul. Deputy Foreign Minister Tzipi Hotovely and Justice Minister Ayelet Shaked have been leading the charge to remedy this diplomatic jihad against the State of Israel at its source. Loyal IDF reservists, also outraged by the exhibit, have mounted their own campaign against what they claim is a false and unfair assault on the military and the nation. In the wake of the international stir over the legitimacy of the travelling exhibit, the mayor of Cologne, Germany, first cancelled, but then reinstated its scheduled appearance there. Beyond this single inflammatory exhibit against the IDF, however, lies a much more complex and malignant problem — one that brings to the forefront some disturbing concerns and questions about the nature and purpose of foreign government funding of NGOs in Israel : What is their real agenda? How and where are they getting their money? Are they using their funds for purposes consistent with their stated goals? A chief concern in Israel’s Knesset is how to curb the influx of millions of foreign dollars used to fund anti-Israel hate-groups operating as NGOs. These organizations are accused of using their “human rights” designation to mask a deceptive advocacy agenda to undermine, and even to destroy, Israel. Breaking the Silence is one of the smallest. Founded in 2004, BtS is registered as “a company for the benefit of the public” with a budget of roughly 3 million shekels ($770,000 USD), according to 2015 figures. According to a recent report by the Israeli organization Im Tirtzu, partial funding for Breaking the Silence ($300,000), B’Tselem ($700,000) and other pro-Palestinian NGOs in Israel — totaling $11,000,000 in 2014 alone — comes from The Human Rights and International Humanitarian Law Secretariat (HRIHL), an Arab foundation based in Ramallah and Gaza. HRIHL, in turn, is funded predominantly by the governments of four European countries: Sweden, Denmark, Switzerland and The Netherlands. “When we use the concept ‘political terrorism’ we wish to indicate various actions which are not actually physically violent, but which are intended to spread terror and fear … for the achievement of political aims. Two of the wealthiest international human rights NGOs at work in Israel are OXFAM and World Vision. Oxfam, which operates an international confederation of networked organizations in 92 countries, had a total income in 2012-2013 of $955.9 million, of which $18.7 million was spent in “Occupied Palestinian Territory” in 2013. OXFAM states clearly that it does not participate in the Boycott, Divestment and Sanctions (BDS) movement against Israel, yet affirmed its boycott of goods made in the “Israeli settlements in the West Bank”. We are clearly not hearing the truth. Pressure from OXFAM and BDS groups contributed to a recent decision by SodaStream to close its factory in Mishor Adumim, where it had employed hundreds of Arabs and Israelis working peacefully side by side. Arab wages and working conditions at SodaStream were reported to be significantly better than their equivalents in the neighboring Arab-controlled territories in Judea and Samaria. When the plant moved, hundreds of Arabs were thrown out of work — a result that apparently did not bother proponents of BDS such as OXFAM. When Israel works to build “bridges for peace,” such as SodaStream, where Arabs and Jews worked peacefully together, these organizations promptly knock them down. World Vision International, a Christian charity that operates in approximately 100 countries, with a 2012 budget of $2.67 billion, defines the region it serves as Jerusalem/West Bank and Gaza. World Vision makes no bones about its exclusive ministry in the area on behalf of poor Arab children. Conversely, it specifically does not serve the needs of poor Israeli-Jewish children. An estimated 14.1% of Jewish Israeli families live below the poverty line. No one at World Vision asks the obvious question: Why are there even refugee camps in territories controlled by the Palestinian Authority (PA) and Hamas, such as Gaza, Jenin and Ramallah? Not only have those areas been under exclusive PA or Hamas civilian administration since 1994, but Israel totally evacuated the Gaza Strip in 2005. Both OXFAM and World Vision receive large sums of money from the United Nations, various government and non-government sources, foundations and other institutions. NGO Monitor issued a report calling attention to the public debate on massive foreigngovernment funding of highly political NGOs. Various media, government and legislative concerns about the manipulation of Israeli democracy by foreign governments through NGO activity triggered the debate that resulted in Israel’s NGO Transparency Law (February 2011). In 2013, there were several failed attempts to pass bills in the Knesset to reduce the influx of foreign government money. Now in the wake of the Breaking the Silence exhibit, Hotovely, Shaked and others are mounting a renewed effort to remedy at least this one source of diplomatic jihad against the State of Israel. Through various partners, World Vision operates 14 programs in Bethlehem, West Ramallah, East and South Hebron, Northeast, West, and South Jenin, Southeast Salfit, East, Central, North, and South Nablus, as well as North and South Gaza.